Philip is a traditional name for a boy, overlooked during much of the twenty-first century. Philip: One L or Two? Phillip is the more common spelling in recent decades. It was a Top 100 go-to from the 1930s through the 1980s. Most famous Phils spell their name with two Ls, which makes it easy to forget that the single-L spelling came first. It was in the Top 100 in the nineteenth century, ran neck-and-neck with Phillip, and was only slowly edged into second place. The name comes from the Greek philos – friend – and hippos – horses. 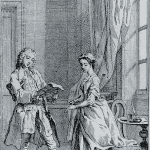 Phillip was initially more common as a surname form. In the ancient world, five kings of Macedon bore the name, as well as two rulers of the Seleucid Empire and a Roman emperor, plus historians, statesmen and saints. 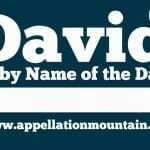 In the early Middle Ages, it became a favorite name for the Kings of France, as well as rulers of Spain, Portugal, Navarre, Burgundy, Savoy, Artois and Flanders. The current King of Spain is Felipe VI. Athletes, including NFL quarterback Rivers and golfer Mickelson. Heavy metal’s Anselmo, frontman of Pantera, and Thin Lizzy’s Lynott. And, of course, there’s self help guru Dr. Phil and that prognosticator of prognosticators, Punxsutawney Phil, the best known of the weather-predicting groundhogs. Among the most famous fictional Philips is the hero of Charles Dickens’ Great Expectations, though he’s known as Pip. It’s the first name of Raymond Chandler’s detective Marlowe. Nickelodeon gives us animated twins Phil and Lil DeVille on The Rugrats. Not surprisingly, this name translates into nearly any European language: Philippe in French, Felipe in Spanish, and Filip in many a Slavic tongue. None of that seems to matter in the US, where the name has been falling for decades. The double-L spelling is down to #410 as of 2015, while the single-L stands at #434. I thought that Philip’s fortunes might change in 2012. When The Office’s eighth season debuted in September 2011, both Pam and Angela were expecting. And both wanted to use the same name for a son: Philip. Pam was inspired by her grandfather; Angela, by her cat. They both dug their heels in and argued about who could use the name. In the end, both television families welcomed a baby Philip. I thought that could be the name’s moment, and indeed, there was a small uptick in use of both spellings in the following year or two. But it didn’t last, and the name continues to slide. 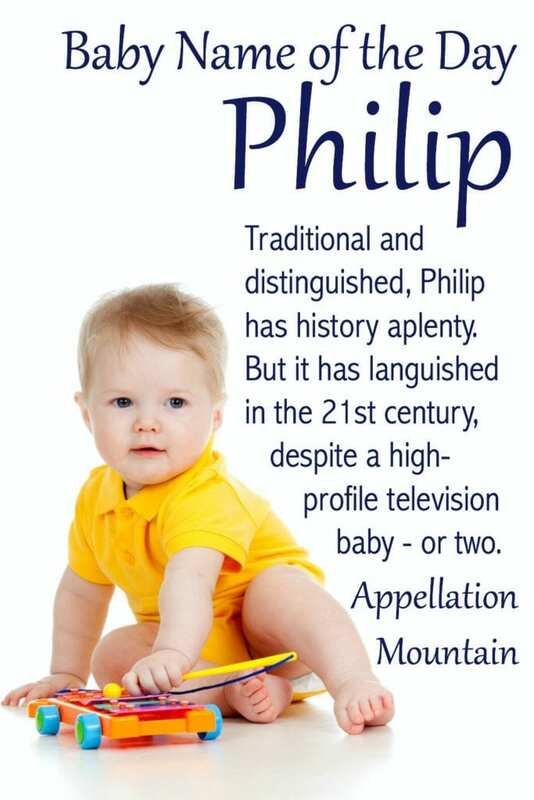 If you’re the kind of parents who prefer nickname-proof names, Philip could be a surprising option. While Phil feels more like your great-uncle or maybe the nice guy down the street, use the name in full, and it’s rather handsome. Or take a page from Dickens, and call him Pip as a child. It’s a great possibility for parents crushed that Benjamin, Alexander, William, and Henry are so very popular. What do you think of Philip? Do you prefer the name spelled with one L or two? And do you think there’s any hope of a revival? This post was originally published on December 20, 2008. It was substantially revised and re-posted on June 13, 2016. I know a boy named Phillip, he is a very nice kid. I am always spelling his name wrong! My dads name is Philip and he hates having to correct people with the spelling of only one ‘L’. He tells me to call my kids names that are obvious to spell. I get asked all the time is that Sarah with or without the ‘h’ – to me Sara isn’t Sarah at all. So I didn’t listen as I have to spell the most simple of names anyway and have named our third child with his name – Riley Philip 🙂 and I love it. Philip/Phillip just does nothing for me. Maybe I know too many – it feels generic. And I hear “fill up” as though I’m going to go fill up my car with gas. I like the name a lot but I dislike Phil so much 🙁 I like Flip and Pip though. I just don’t want to be constantly correcting people on which nickname to call him. I don’t want Phil to “stick”! I feel similarly about Thomas. Hate Tom/Tommy. Might have to just use as middle names. My husband’s name was Philip, called Phil all of his life. Naturally, I love the name! When I asked his mother why he picked the one L spelling versus the two spelling, she said that someone told her that the one L spelling was to be used for first names and the two L spelling used for last names. Made a lot of sense! I do like Philip! We had a little first grader last year with this name, but it’s certainly not one we hear at my school very often. My dad’s name! Well, actually it’s Philippe, but he goes by Philip in Australia, usually. [he’s French!]. I don’t mind him, but I don’t think I’d use him as a fn.. a middle maybe. As others have noted, I don’t really have any strong feelings about him. He’s sweet and has strength, but comes off a little lacklustre to me. You really cannot under estimate the power of a positive/negative name association can you? I was racking my brain last night to figure out why I’m not into Philip and I think a large part of it is to do with the Philip’s I’ve met – all nice enough middle aged men but slightly dull and rather unmemorable. I have a bit of a soft spot for Philip because he’s my favorite of my little brother’s best friends. He’s been such a sweetheart since he was a kid, and still is. He’s really the only association I have, so I have to say I like Philip. I think he’s strong sounding but a little soft at the same time. It’s not something I’d use, but the nickname Flip sure does appeal to me. Kate, Katharine, whatever – I complete agree about Philippa! I’m not sure about ‘Flip’ JNE, however I do agree with you in general about Philip. I love Royal names but Philip is probably the one that I find least inspiring. I don’t know why, I mean I should like him, he has all the attributes I usually love including a sound I usually go for (Amelia, Camilla, Cecily, Romilly – need I go on?!) but Philip just doesn’t set my world on fire. It’s most puzzling. True to form though, I feel much more warmly towards the feminine version Philippa, how does everyone else feel? I don’t have any strong feelings about it one way or the other. It’s one of those names common in people my age and a a bit older, usually known as Phil. I wouldn’t be surprised if someone chose it, though it’s not in fashion now. Flip is kind of cute. Despite generally liking the “royal” names, I’m not a big fan of Philip – Dr Phil and the British Queen Elizabeth II’s blundering husband, Prince Philip don’t help. Having said that, the nickname issue – a family friend, a Phillip, goes by “Flip” – kind of fun and a little different – what do you think? Philip has been a favorite since I was a kid! He’s Aurora’s Prince. Until “the Little Mermaid” there was not another Disney Princess or a Prince with with a first name. That might be where I heard Philip (Phillip in the film) first but I’ve known a handful of Philips throughout my life. Some Phil, which doesn’t bother me the slightest), some Pip (two of them, big, strapping guys they were too) or simply Philip. Which I thoroughly like too. On top of that my Grandmother’s next younger sister married a L. Phillips thus bringing Phillips into the family as a surname. I like his strength, his energy and his look: gracefully gray at the temples. I think Philip & Kenneth would work fantastically as brothers. (another chance at NotD, perhaps?) Philip get a huge “thumbsup: from me! […] Philine – the perfect middle name to honor a Philip or a Phyllis! […] Phil is a grandpa – again. […] of girls’ names end with -ela: Adela, Carmela, Gisela. Elizabethan poet Sir Philip Sidney invented the name for his Arcadia, a late sixteenth-century masterwork.